IPCC Working group II, “Impacts, Adaptation and Vulnerability” has today published its Summary for Policymakers. The main report has also been published, divided into two volumes: Volume 1, the first 20 chapters, is on global effects and Vol 2 (chapters 21-30) is on regional aspects. At the time of writing (Monday 31st March morning) the SPM link gives and error “HTTP Error Status: 502 Bad Gateway”; on twitter, Clive Best suggests that global warming has caused the IPCC’s web servers to fail. The press release has the headline “A changing climate creates pervasive risks but opportunities exist for effective responses”. Among other things, the press release says “The nature of the risks of climate change is increasingly clear, though climate change will also continue to produce surprises.” It goes on to include several quotes from IPCC WG2 co-chairs Vicente Barros and Chris Field. Media coverage has been varied, as one might expect. The Radio 4 Today programme featured Richard Tol’s dissenting voice in the news bulletins at 7.00 and 8.00, and the 8.10 session was an interview with IPCC author Chris Field in which the BBC interviewer Justin Webb was asking questions about an apparent increasing focus on adaptation (more on that story later this week). The BBC website presents a different story. Climate impacts ‘overwhelming’ says Matt McGrath, and quotes the most alarmist bits, such as “severe, pervasive and irreversible”. Anthony Watts has a summary of some of the main statements from the SPM. The Independent is on form, leading with “The apocalypse is coming: War, famine and disease are on way”, and an article titled “War, famine and pestilence – ‘Climate change is happening and no one in the world is immune'”, by Steve Connor, the chap who told us in an ‘exclusive’ that the Arctic ice was all going to disappear in 2008. He ends up promoting the veggie-vegan agenda – we are going to have to give up meat and cheese. The Telegraph headline is Britain faces food price rises, floods and deadly heatwaves. An encouraging note is that the comments at the Telegraph are overwhelmingly sceptical, and even at the Independent sceptics are well represented. Carbon Brief has a roundup of the coverage. The IPCC Website is now up again so the SPM is available (Monday 12:00). Interestingly, in some respects the final SPM is less alarmist than the version leaked a few days ago. For example, March 25 version, first paragraph: “recognizing that there are limits to adaptation”; final version “The report assesses needs, options, opportunities, constraints, resilience, limits, and other aspects associated with adaptation.” Previous version page 5: “The health of human populations is sensitive to shifts in weather patterns and other aspects of climate change (very high confidence)”. Final version: “At present the world-wide burden of human ill-health from climate change is relatively small compared with effects of other stressors and is not well quantified”. Previous version p 9 “Unchecked emissions increase the likelihood of severe and pervasive impacts that may be irreversible or unanticipated.” removed for final version. The word “overwhelming”, used in Matt McGrath’s BBC headline, does not appear in the SPM or the press release. Hilary in comments below draws attention to the IPCC WG2 movie; I confess I could not force myself to watch beyond the first two minutes. James Delingpole reports that a plague of giant scorpions will eat all the baby polar bears. The Daily Mash criticises the report for not being terrifying enough and not addressing the issue of spontaneous combustion. Yesterday the BBC World Service described Bob Ward as a climate scientist. Then Andrea Sella described him as a professor. Today, Spiegel Magazine says he’s an IPCC author. Mark Steyn, in his commentary on the BBC Curry/Ward debate, also referred to Professor Ward, and then put in an update to correct this. Now he’s written another post, Should I Sue Bob Ward For Libel? linking to here. Also, Alex Cull has produced a transcript of the BBC World service slot with Curry and Ward. IPCC Working Group 2, “Impacts, Adaptation and Vulnerability” is currently meeting to finalise its Summary for Policymakers (SPM), which will be published in a few days time (discussed in this BBC report which says that Richard Tol has asked for his name to be removed because of the increasing alarmism). The draft SPM was leaked last November. Now there is a new leaked version, which is the November version plus some edits marked in blue. The edits are interesting, showing a ramping up of alarm and a down-playing of adaptation in favour of mitigation (ironically, the opposite of what Andrew Lilico is claiming in the Telegraph). In the AR4 WG2 SPM (2007), the word ‘mitigation’ only appears 6 times, while ‘adaptation’ appears about 35 times. In the new document, there seems to be more emphasis on mitigation alongside adaptation (recall that mitigation is supposed to be the remit of WG3). Insertion of claim that droughts, floods and cyclones are climate-related (apparently contradicting WG1). Can readers find other examples? Or examples of where the edits downplay alarm? The Government’s Chief Scientific Adviser, Sir Mark Walport, has been touring the country speaking about climate change. The slides from his talk last Friday in Glasgow “The Planet in our Hands: Responding to Climate Change” can be found here as a pdf file or here on slideshare. He has given the same talk in Bristol, Birmingham and London. There are several points to take issue with in Walport’s presentation, see this Bishop Hill thread, but here I will focus on just one. Slide 22 has the heading “Scientists have increasing confidence in attribution of extremes”. This is a false statement. In fact the opposite is true – confidence in attribution of extreme events to climate change has declined in the last few years. 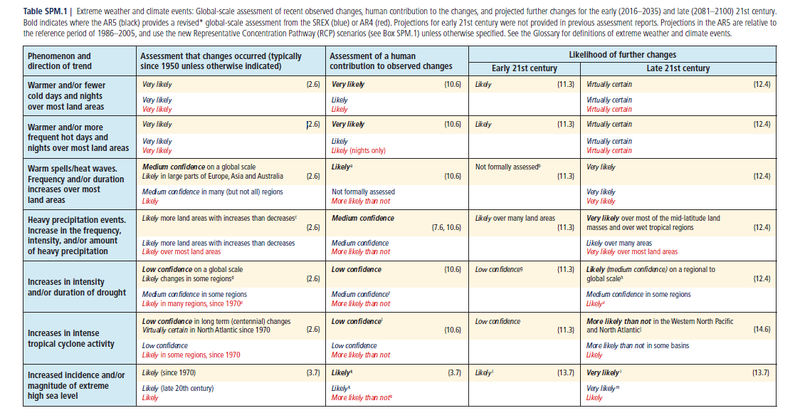 To see this, we only need to look at table SPM1 from IPCC AR5, which helpfully includes a comparison with the corresponding statements from AR4 (in red). With regard to heavy precipitation events (featured prominently in Walport’s slide) the AR5 statement is “Likely more land areas with increases than decreases” which is less confident than AR4’s “Likely over most land areas”. With regard to droughts, the IPCC assessment of human contribution has declined from “More likely than not” in AR4 to “low confidence” in AR5. Confidence in current and future increases in tropical storms has also decreased. More details of the IPCC climb-down over extreme events are given by Roger Pielke, with some specific quotes from the main AR5 report, and ending with some sound advice for Walport: “Climate campaigners would do their movement a favor by getting themselves on the right side of the evidence”. Similarly Judith Curry says “The AR5 is less confident than the AR4 in terms of increasing heat waves, drought, and tropical cyclone intensity”. I’ve also reported here more details of what the IPCC says about flooding and tropical cyclones. I am sure that Walport is an honest man, though misguided and ill-informed. The question that arises is, who is advising him and giving him this false information? Here is a screenshot of that table, SPM.1. Click to enlarge. A transcript is now available for the second evidence session (11 Feb) of the IPCC 5th Assessment Review being conducted by the Energy and Climate Change Committee. Points of interest included the failure of Emily Shuckburgh to answer Peter Lilley’s question about whether the warming slowdown had influenced confidence, the subsequent spat between Lilley and the Chairman Tim Yeo, some quite detailed discussion of initial conditions and of ice cover, James Painter’s comments about a slight decrease in public concern over climate, and a substantial discussion of economic policy, discount rates etc. This third session seems to be diverging further from the original terms of reference of the inquiry, and becoming less relevant to the recently published IPCC AR5 WG1 report, since the WG1 report is on the core science and has nothing to do with policy or mitigation/adaptation strategies. It is discussed at this Bishop Hill post, with follow-up posts here and here. The BBC seems to have lost interest – it’s not covered on BBC parliament or BBC Democracy Live, as the previous sessions were. Nicholas Lewis and Marcel Crok have written a report “Oversensitive: How the IPCC hid the good news on global warming”. There are two versions – a 44-page report and a longer one with 72 pages. The Report was supposed to be released today but it seems to have been sitting on the GWPF website for a few days. The main conclusions of the report are that the IPCC exaggerated the climate sensitivity in its 4th (2007) report, and then its 5th (2013) report tried to hide away the more recent results indicating a lower sensitivity (for example by failing to give a best estimate for climate sensitivity). The IPCC also puts too much weight on models, and too little on observational data. It’s discussed at Bishop Hill, Climate Lab Book, Climate etc, WUWT.